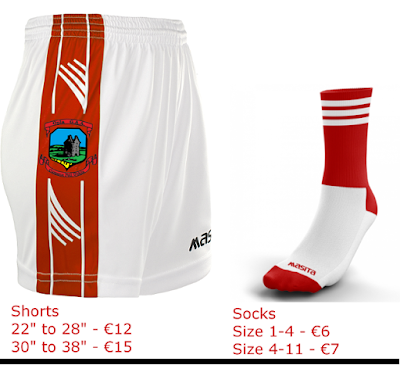 We are offering the option to buy Oola GAA logo shorts and half-socks in Oola colours at discounted prices. These offers are only available when paying club membership for 2018. *** NOTE: This is only an option, basic membership without gear is still available as in previous years. You will be contacted about registration days where payment for membership and gear can be made. NO ORDERS WILL BE PLACED WITHOUT FULL PAYMENT OF 2018 CLUB MEMBERSHIP AND PAYMENT FOR GEAR. Form can be completed here (must be completed for each player).